I’ve kind of fallen in love with this recipe, which is just a component in a meal to come. So I guess it’s a “teaser” recipe. 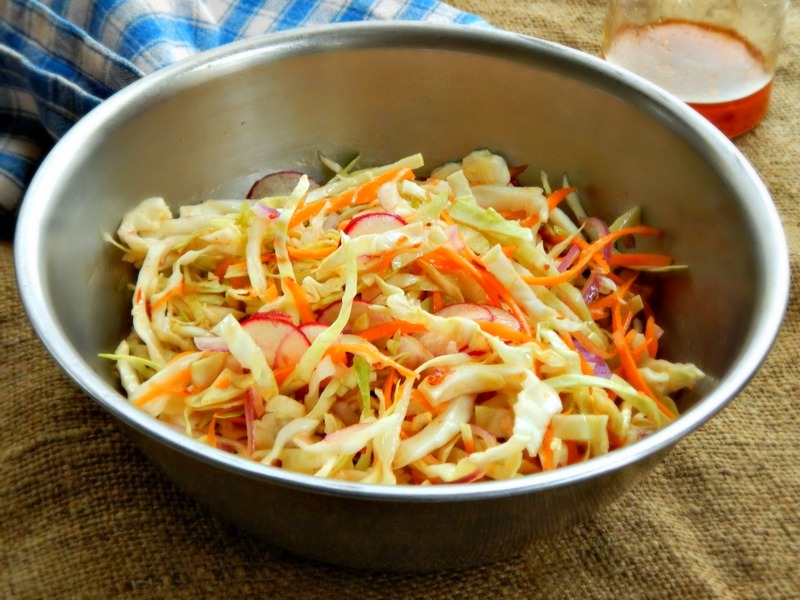 Bright and crunchy with a Vietnamese “flair” this is a marvelous slaw to serve with all kinds of things. The upcoming recipe is Vaguely Vietnamese Slow Cooker Tacos, and I’ll have that out to you, soon. It’s been a crazy, crazy week! Painting, puppy classes, yard work & Halloween decorating! But back to the slaw – I’ve already made it twice this week. The flavors are a bit addicting. While I served this slaw initially with Slow Cooker Tacos, it also came out again as a side with some pulled pork sandwiches and a side with plain old sandwiches for lunch. It just gets better and better over time. On the first day, it was bright, crunchy and a little benign. The second day the cabbage had absorbed a bit more flavor and the slaw developed a bit more of a kick. With a slaw like this, you can add just about any vegetable your heart desires, but I stuck with the basics. The recipe in the Times used Asian pear (which, alas, the folks apparently took a bite out of and tossed in the trash) and cucumber, which I forgot. I loved it as is, and repeated my “mistakes” for the second round! For the dressing, in a small bowl or jar, combine the vinegar, lime & zest, ginger, oils, Sambal Oelek or Sriracha to taste, sugar & fish sauce. Mix together. Place slaw ingredients, the cabbage, onion, carrots and radishes and mix together. Add dressing to moisten (there may be a bit leftover dressing) and toss to combine. Garnish with cilantro if desired. This is best if made a little bit ahead and continues to improve with time. This entry was posted in Click here for Fabulous Food Posts and tagged Asian, Cabbage, cabbage slaw, Carrots, Frugal Hausfrau, radish, Red onion, Salad, Salad Dressings, Side, Slaw, Vegetable Side, Vietnamese. Bookmark the permalink. This would work for many dishes. Great flavours. I like that this ages over time so well! I hate that mayo-based slaws get so watery and weird the next day. Looks great… can’t wait for the rest of the meal! As a fellow fan of slaws I love this recipe and although I always make too much what’s great is that it keeps well in the fridge for days! I love them, too. I love cabbage and it’s so good for you…I seriously can just snack on this all day! Oh, Rhonda, I stole the name! I didn’t credit it, did I – Well, the main dish is from Sam Stilton of NY times and I’ll have that post out today and make sure to credit him…and not so vaguely! lol! I know just what you mean by “real food” I can get a little esoteric now and then but the bottom line is I have to make food that appeals to the folks – doesn’t mean I don’t try to throw in a few special touches or as many veggies as I can get by with, lol!! You’re right– sometime I’m tempted by a recipe that would make a beautiful photo!! (future blog post! )– but then think, would we really love to eat it?? And I’m working on the veggie part… In any case, love the things you make! thanks!